So, what do you get when you cross a gamma-radiation contaminated man with a mutagen-induced mutant turtle? You get this guy. Teenage Mutant Ninja Hulk (Well, maybe he’s more middle-aged than teen-aged). 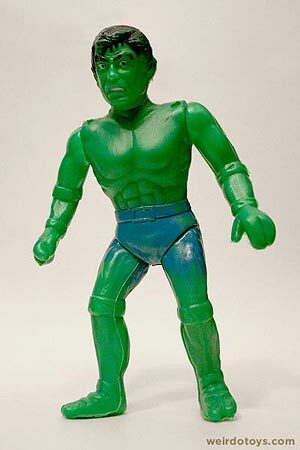 My question is – Is this guy more of a Hulk toy or a Ninja Turtle toy? Green skin: Could be Hulk. Could be Turtle. 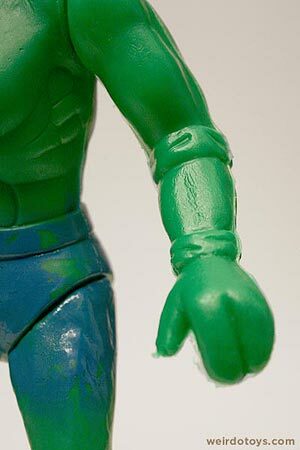 3-fingered hands: Looks like Ninja Turtles. Elbow pads and wristbands: Looks like Turtle gear. 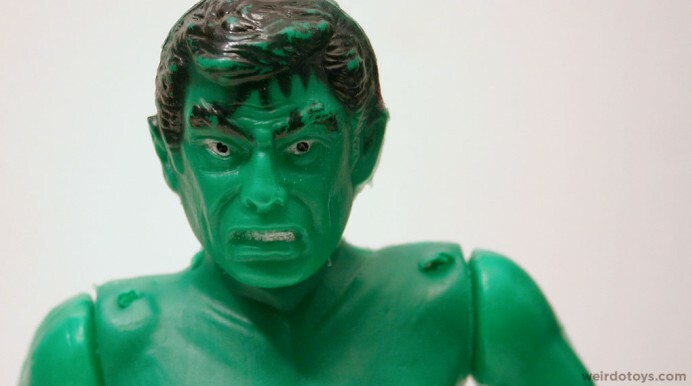 Angry green humanoid: Hulk and Turtle i guess. I’m not sure if that shed any light on the subject. 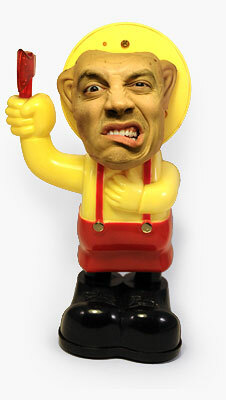 All I know is this is a cheapy-as-hell Mexican toy. 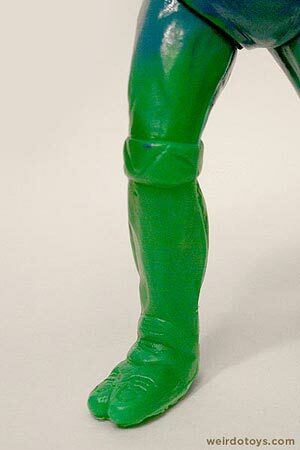 It’s flimsy, hollow plastic, and it looks to be made up of random, poorly made molds of TMNT arms and legs with Hulk torso and head. 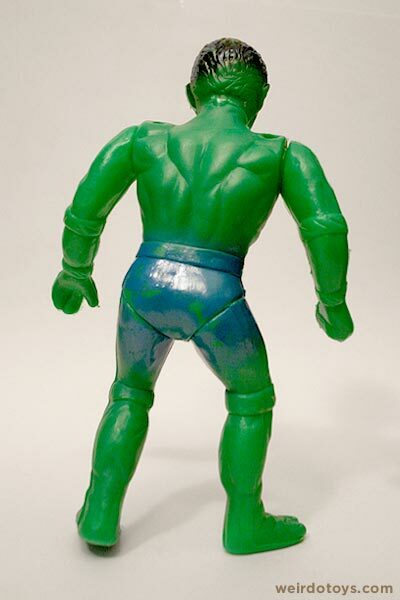 The badly painted-on pants give the toy a nice touch of crappiness, and the holes in his shoulders give the guy a little bit more mystery. Maybe those were places where a cape or parachute connected. 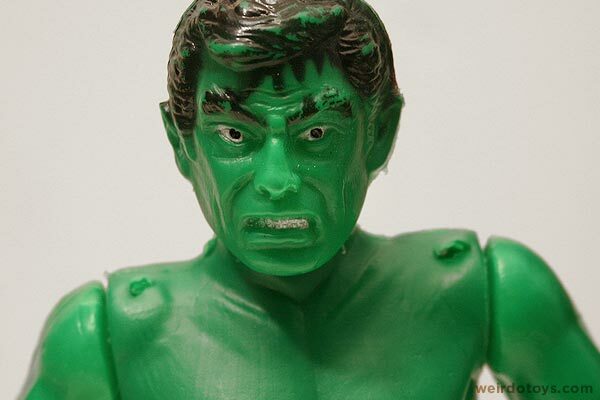 So, the new Incredible Hulk movie is coming out this summer, and this comedic monstrosity is what the unfortunate Mexican children get to play with when they ask for a new Hulk toy. It also looks like the “Just For Men” hair color ran down his forehead…AWESOME! I love the Cowabunga Hulk SMASH! nice touch! That looks like 10ct toy. The ones made to tie up to rockets or melt with magnifying glass. Is it just me, or does the crotch area look a little worn? What’s that all about?